I had some leftover anchovy fillets from making a Honey Mustard Glaze for the Herb-Crusted Rack of Lamb and I was trying to figure out what to do with these little fishies. Last time I had cooked with anchovies, it was for Spaghetti alla Puttanesca, a spicy and salty Southern Italian dish that consists of tomatoes, onions, capers, anchovies, chili peppers, and olives. The name “puttanesca” is a derivation of the word puttana which means “whore” in Italian — so the dish is literally called the “whore’s spaghetti.” There are a number of theories as to the name’s origins: some claim the spicy, pungent aroma enticed passerbys, others say it’s because this was a quick and easy meal to make in between customers as all the ingredients are basic staples that keep well in the pantry. I wanted to make the dish again but sans the pasta and so I decided to substitute chicken for spaghetti. 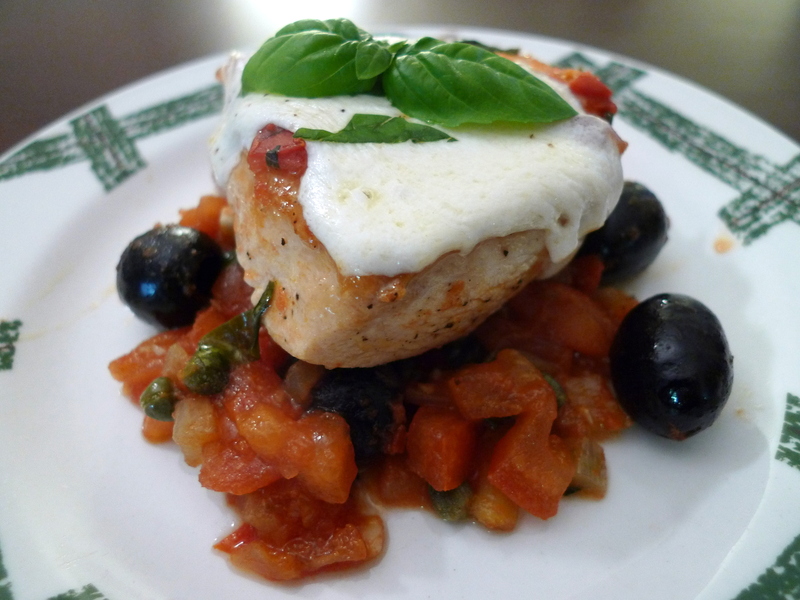 I found a couple recipes for “Chicken Puttanesca” online and tweaked my recipe with borrowed elements from For the Love of Cooking (love the melted cheese topping!) and Grouprecipes. I was super pleased with how this dish turned out, and I am always glad to add another quick and simple chicken recipe to my cooking repertoire. I served this with some Sautéed Asparagus with Mushrooms. You can serve this over spaghetti if you desire a “Pollo & Spaghetti Puttanesca”, but I would double the sauce as we like the “more stuff to pasta” ratio. Heat 1 T olive oil in a large skillet over medium-high heat. Season the chicken breasts with salt and pepper (if using large chicken breasts, cut in half). 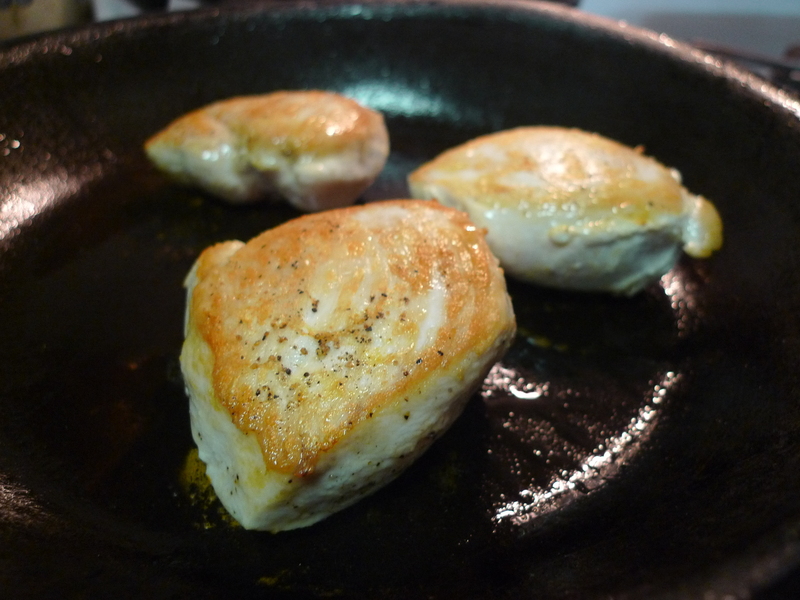 Add the chicken to the skillet and cook until golden brown, 3-4 minutes. 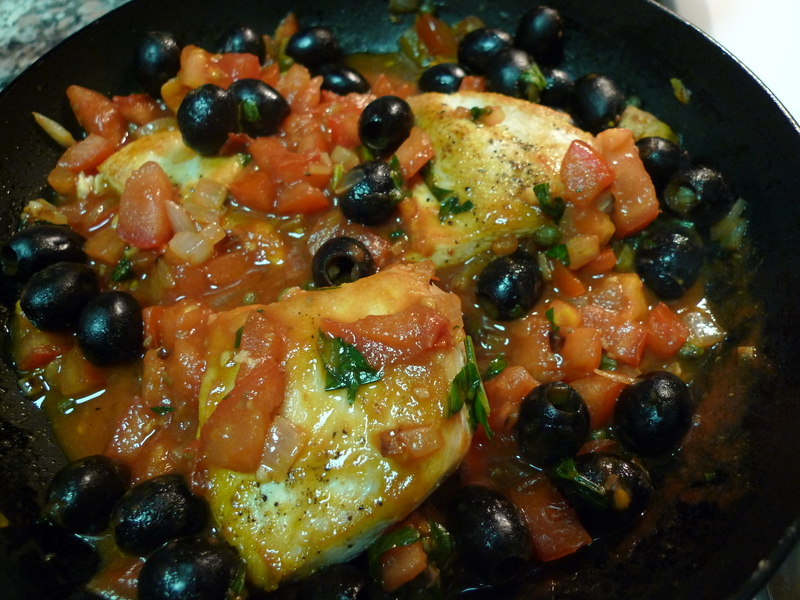 Remove the chicken and set aside on a plate while you prepare the sauce. Heat the remaining 1 T olive oil in the pan and turn the heat down to medium. 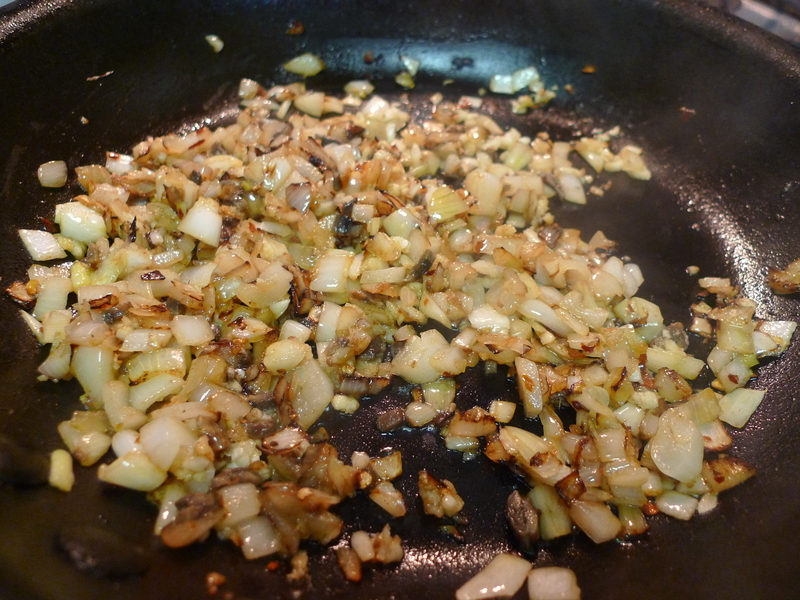 Sauté the onions for 1-2 minutes until tender, and then add the garlic and red pepper chili flakes and cook until fragrant (1 minute). Stir in the chopped anchovies and cook until they dissolve. Add the diced tomatoes, tomato paste, and capers. Simmer over low heat for 10 minutes, or until the sauce is thick and pulpy. 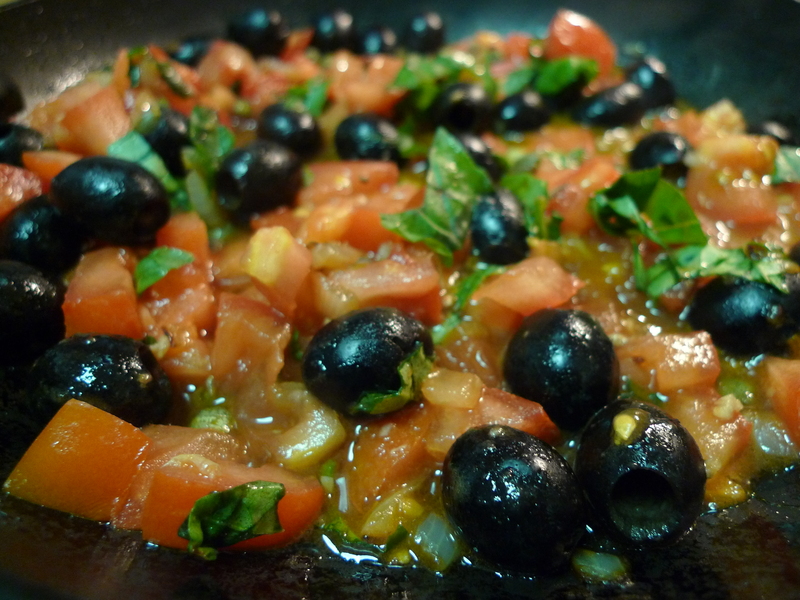 Stir the olives and basil through the sauce. Return the chicken to the pan and continue to simmer until chicken is cooked. 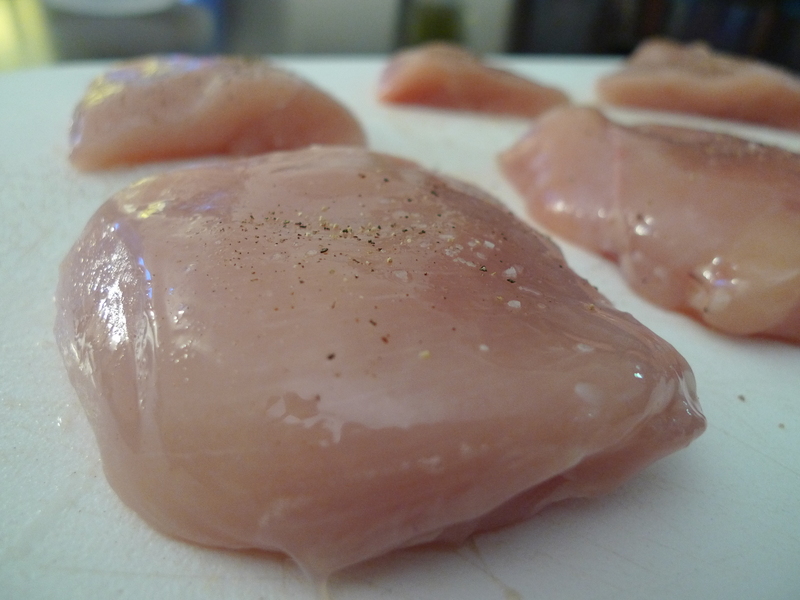 For boneless breasts, this could be as short as 5 minutes, or as much as 20-25 minutes for bone-in. Optional: Transfer the chicken and sauce to an oven proof pan. 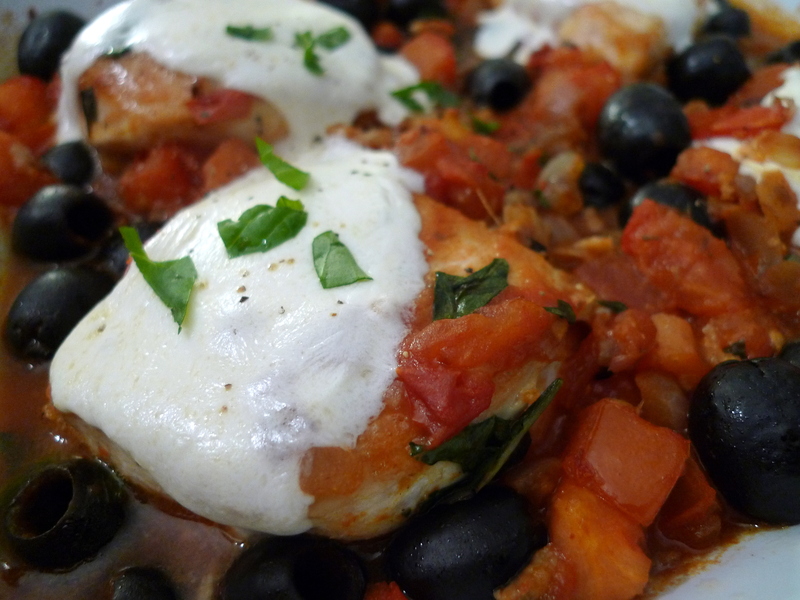 Lay a thin slice of mozzarella cheese on each piece of chicken. Place the pan in the oven for 2 minutes, or until the cheese has melted. Garnish with fresh basil. You can mix this with pasta to make it a “Spaghetti and Chicken Puttanesca.” However, I wanted to keep the meal light and so I opted out of the pasta and instead served this flavorful chicken dish with some Sautéed Asparagus with Mushrooms. Sounds good, but without the olives. Sorry I just don’t like olives. totally understandable. they are very very salty… i didn’t like them for a very long time but somehow Natalya trained me to like them! Your post made me chuckle. I had no idea where that term came from! Love this recipe and it just turned out beautifully. haha food history deserves its own major i think! there’s a restaurant in nyc called puttanesca… have not tried yet but curious if there’s any theme implication there….